The number of connected adults continues to rise in the US. Based on our Technology User Profile (TUP) 2017 wave, there are 212.6 million adults who regularly connect to the Internet using a PC, Mobile Phone, Tablet, or Game Console. This number is up 18.9 million from the 193.8 million adults we reported in our TUP 2013 wave. While some of the increase has come from a growing adult population, the share of adults actively connected has also grown, due in large part to the increasing use of Smartphones. The use of Tablets such as Apple’s iPad has also expanded since 2013, although declined somewhat in 2017. Home PC usage has remained relatively stable, having appeared to be on the decline after 2013, only to regain again slightly. In part, this return was supported as buyers picked up new All-in-One and Gaming PC designs. Also, many online shoppers are still preferring their larger-screen PCs or Tablets over their Smartphones. Use of Home Printers continues to have steady, if modest, growth. The percent of Home PC users with Home Printers has rebounded from 82% in 2013 to 88% in 2017. Home inkjets continue to be the user’s printer of choice. American Technology Users are getting older, on average. The average (mean) age of Connected Adults has increased gradually since 2013, rising from 44.1 to 44.9. The average age of Smartphone users has grown the most dramatically, rising from 37.2 in 2013 to 43.1 in 2017. Similarly, the average Tablet users is older than only a few years ago, rising from 40.2 in 2013 to 44.2 in 2017. Home Desktops continue to be used by older adults than users of Notebooks, Smartphones or Tablets, although the average age has declined somewhat. Digging deeper, we looked at the shifts in usage rates for key devices among parents. Adults with children are the biggest spenders on technology devices and services, as we’ve reported in other findings we’ve released from MetaFacts TUP. Smartphone usage has grown strongly between 2013 and 2017, although is appearing to be leveling off to be just slightly higher than the current level. At 87% of adults with children, Smartphones are ahead of Home PCs. The use of Home PCs by parents has dropped somewhat from 85% in 2013 to 78% in 2017. Home printer use remained a steady 70%-71% among parents. Adults with children make up 37% of Connected Adults in 2017, higher than the rate in 2013, which was 32%. In addition to being a sizable segment of the market by numbers, as we’ve reported elsewhere in TUP, they spend much more than the average adult on technology devices and services. Adults in one-person households have a different profile than parents. To begin with, Home Notebooks are used by fewer adults in one-person household than among adults with children, at 43%. Smartphone and Tablet usage has grown, although trails usage rates among parents. Home Printer use has sagged among single adults, dropping from 68% in 2013 to 63% in 2017. Solo adults make up 20% of Connected Adults in 2017, effectively the same rate as in 2013, at 21%. The trend is continuing with a multi-device experience for many years to come. Although Tablets appeared to be emerging as a third device, most users actively use both a mobile phone and PC. While Smartphones are growing in use, they aren’t fully replacing PCs or Tablets for most of user’s activities. Although consumers continue to explore and experiment with ways to enjoy what they have, changes in behavior can come slowly. The inertia of consumers is a major factor. This TUPdate includes a complimentary brief summary of recent MetaFacts TUP (Technology User Profile) research results. These results are based on results of the MetaFacts Technology User Profile survey, from 2013 through 2017, its 35th consecutive wave. Similar results are available through TUP fielded in Europe and Asia. For more information about MetaFacts and subscribing to TUP, please contact MetaFacts. 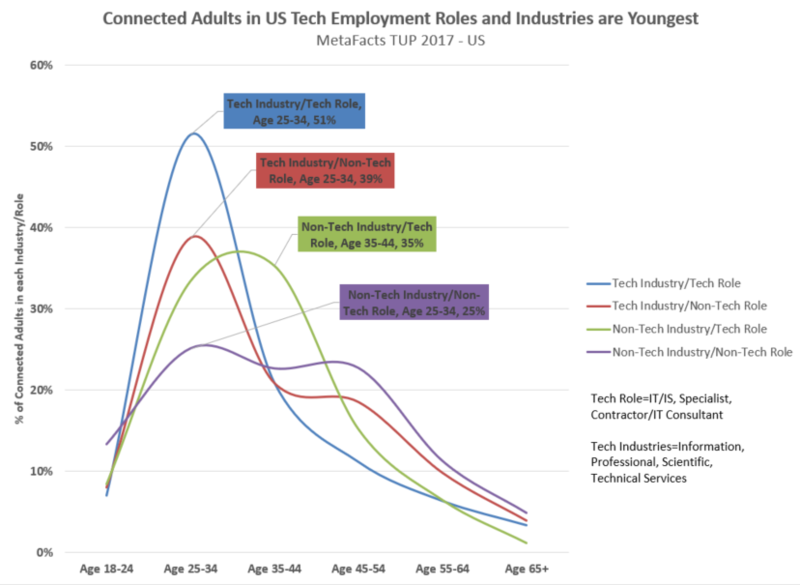 Employees in technology roles or industries are strikingly younger than employees in other US employment roles and industries. As released in our most recent wave of Technology User Profile – TUP 2017 US – our research shows that employees in either technology-focused roles or in technology-oriented industries are much younger than the average American employee. Also, those employed in both technology roles and technology industries are youngest of all. Just over half (51%) of employees in tech roles within a tech industry are age 25-34, the highest concentration of younger adults, with a median age of 34. Employees in tech industry with non-tech roles also have a high concentration of younger adults, with 39% being age 25-34 and median age of 35. By comparison, those in a tech role in a non-tech industry have the highest concentration of employees age 35-44, making up 35% of employees, with a median age of 36. Outside of tech roles or industries, age 25-34 only make up 25% of employees, with a median age of 39. For purposes of this analysis, we categorized tech roles as those in IT/IS (Information Technology/Information Systems), Specialist, or Contractor/IT Consultant. Tech industries include Information (Publishing, Telecommunication), and Professional, Technical, and Scientific Services. The information in this MetaFAQ is based on the most recent wave of Technology User Profile (TUP) – the TUP 2017 waves into the US. Current TUP subscribers can tap into these and additional similar results about adults in the UK, Germany, China, and India. For more information about MetaFacts and subscribing to TUP, please contact MetaFacts.